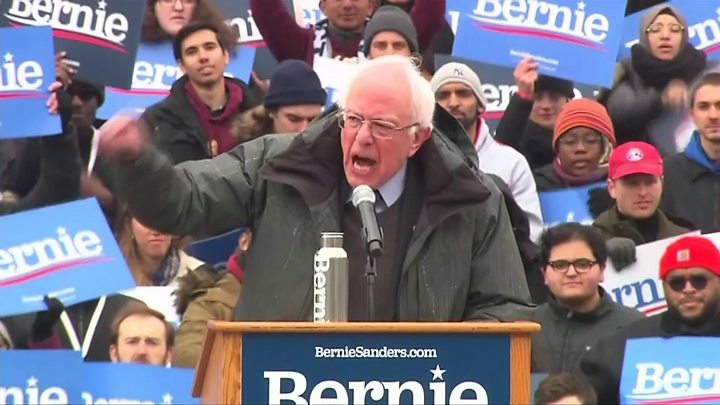 US Senator Bernie Sanders has launched his bid to be president in 2020 with an attack on corporate greed and a promise to unleash a "political revolution". Speaking in Brooklyn, New York, he called Donald Trump the "most dangerous president" in recent US history. Mr Sanders, a 77-year-old independent senator for Vermont, lost the 2016 Democrat race to Hillary Clinton. He faces a much more crowded field this time but brings name recognition and a passionate support base. More than 10 others are also running to be Democrat candidate, including Massachusetts Senator Elizabeth Warren, New Jersey Senator Cory Booker and the Mayor of San Antonio, Texas, Julian Castro. What would a Sanders presidency look like? He promised to fight for "economic justice, social justice, racial justice and environmental justice". One of the challenges Mr Sanders faces is that the Democratic Party has shifted to the left, making his message less distinctive, BBC North America reporter Anthony Zurcher says. Speaking to the BBC, Mr Sanders's brother Larry said the Vermont senator was right to try again for the presidency. "I think Bernard's presidency would be really uplifting, finally to have somebody who people see as honest and has been committed for such a long time to be saying that we don't need the poverty, we can have all the things that we need," he said. "It's all been a kind of crazy dogma that 'oh no, no, no, you can't afford that'." What did he have to say about President Trump? Mr Sanders was born in Brooklyn, and the backdrop for his speech gave him an opportunity to contrast himself with the president. He grew up as the son of a Jewish immigrant who worked as a paint seller, while Mr Trump, who also was born in New York, was the son of a wealthy real estate developer. "I did not have a father who gave me millions of dollars to build luxury skyscrapers, casinos and country clubs," he said. "But I had something more valuable: I had the role model of a father who had unbelievable courage in journeying across an ocean, with no money in his pocket, to start a new and better life." As he was speaking Mr Trump was addressing a conference of conservative activists, in which he attacked the Democrats and promised he would win re-election. He sarcastically mocked Democrat proposals on the environment and said plans for universal healthcare would lead to a "socialist takeover of American healthcare". He is the longest-serving independent in congressional history, but competes for the Democratic nomination as he says standing as a third-party candidate would diminish his chances of winning the presidency. In 1990, he became the first independent in 40 years to be elected to the House of Representatives. He served there until he ran for and won a seat in the Senate in 2007. Mr Sanders entered the race for the 2016 Democratic nomination as a marginal candidate but emerged as a surprise star during a series of televised debates.